I recently acquired Hyperkin's Retron 5 multi-console -- it's essentially an emulator in a console casing, with a generic wireless controller, clean HDMI output, and support for cheats and patches, video filtering options, screenshot captures, and save states for games that never had a save capability originally. It's not tremendously well constructed, and emulation will always have some shortcomings here and there, but this little box has one great feature from my perspective: physical cartridge slots for the Nintendo Entertainment System, its Japanese counterpart the Famicom, the Sega Genesis, the Super Nintendo Entertainment System, and the Game Boy Advance family (including the original Game Boy and the Game Boy Color). This means that a lot of cartridges I've acquired over the years at rummage sales and flea markets can now actually be played on a modern display, and moreover with minimal cleaning and fussing, avoiding a basic issue that has kept me from enjoying NES games in particular as often as I'd like. So I've been digging into my collection a bit, and I came across a title that was always something of a personal nemesis back in the 1980s: Data East's Karnov. This title screen is the cartridge's entire attract mode. There's no title music, no demo sample. Push start or go home. Of course, a decade or two later the NES cartridge turned up somewhere in my travels at a reasonable price and became part of my library. I don't recall spending much time with it in the intervening years, but it came to hand as I was looking for something to play on the Hyperkin box, and so it was time to take Karnov for a spin. Karnov is powerful Russian! Karnov needs no shirt! No neck! No eyeballs! 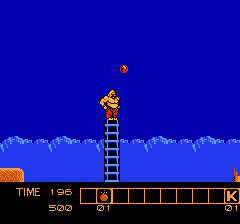 Karnov is a fire-breathing Russian (ostensibly a circus performer and strongman of the non-Putin variety) who has to face down a number of bizarre creatures across 9 fairly brief, relatively slow-moving side-scrolling levels, with the customary boss at the end of each. First level boss! Crazy green fishnik tosses missiles from stupid American fanny pack! There's a little more depth to the game than that summary suggests -- an RPG-lite inventory system tasks our hero with collecting and using bombs, magic wings, ladders and other special items along the way. 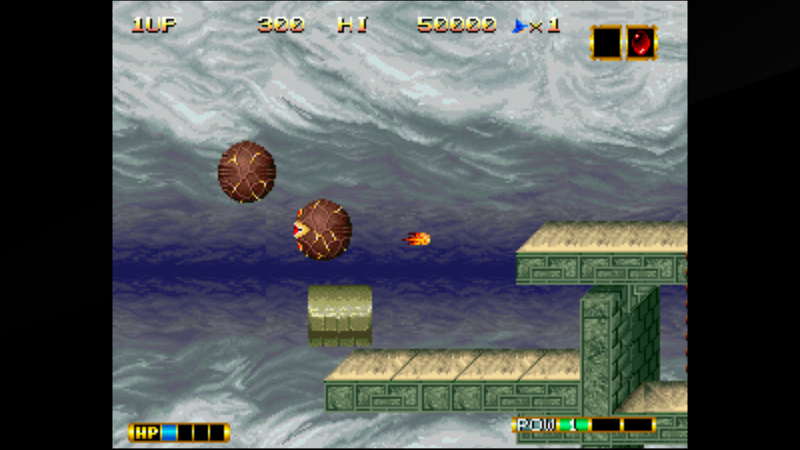 The wings and bombs are critical to getting through level eight, but the other artifacts are more or less optional, which is good because the two-button NES controller means we can only select items by nudging Karnov himself left and right until the desired item is flashing so we can finally press the SELECT key to use it. 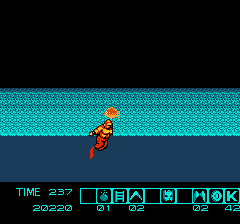 Since the game's side-scrolling structure and limited NES-era memory generally spawns enemies as the screen inches to the right, and re-spawns them if we retreat to the left, this mechanic isn't as much fun as it ought to be. So... I took advantage of modern emulation technology to apply a cheat code, giving Karnov invincibility against everything but falling in a (mercifully rare) hole in the level design. This enabled me to see all nine available environments, and witness the endless repetition of the same background music and the re-use of boss enemies across multiple levels, because, hey, cartridge ROM space didn't grow on trees in 1988. Darn you, capitalist Pepperidge Farm fish-crackers! Go back to your barrel and gorge on American hearty-attack breakfast! Hold, please. Mr. Karnov is taking damage and currently unavailable to come to the screen. In Soviet Union, game finishes you! Exclamation points are expensive, third one sold on black market. 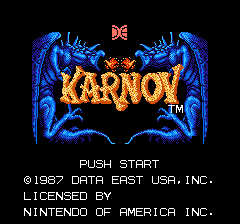 So that's my experience with Karnov on the NES. I'm glad to have finally sort-of-played through the entire game, instead of just watching a YouTube video, but there's not a lot I can say about Karnov. It's very much of its time -- colorful and challenging, reasonably well-ported from the arcade, but also early enough in the life cycle of the NES to get by without pushing the hardware, cartridge size or gameplay possibilities. It's a competent, typical example of the 8-bit side-scrolling videogame, but history has pushed it into the background, overshadowed by NES genre-mates like Super Mario Brothers, Castlevania and Battletoads. It's been quite a while since I've posted anything here, and I'm heading into another busy period so this may be my only post for a while to come as well. 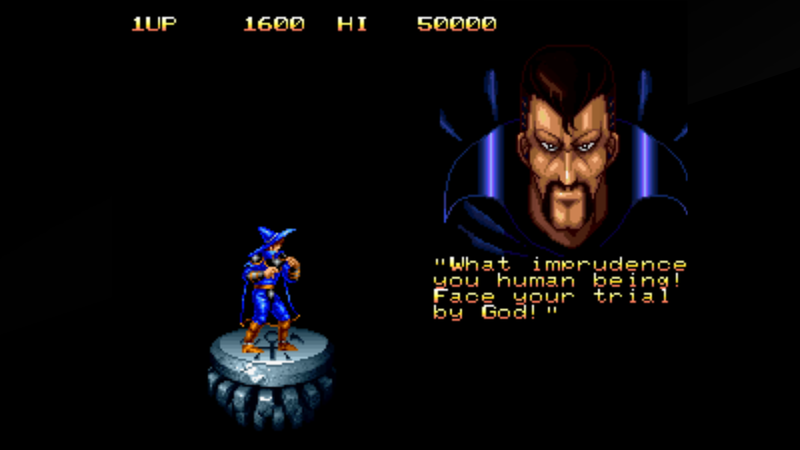 But I've recently found myself drawn back to SNK's Magician Lord, a launch title for the Neo Geo arcade system/console. He's a Magician! He's a Lord! He's Magician Lord! 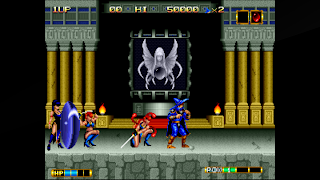 This side-scrolling, single-player fantasy action game was developed by Alpha Denshi working closely with SNK during the Neo Geo's development. 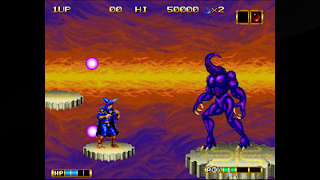 And it was fairly impressive when it hit arcades in 1990 -- the graphics were bold and colorful with scaling sprites and deep parallax scrolling, the audio included digitized speech and music with sampled instruments, and while it was an arcade machine with a difficulty level designed to keep the coin slot fed, it was possible to get a feel for the visual style and gameplay on a single token. But what I think appealed most to me was that you could play THIS version, exactly as it was, at home on SNK's Neo Geo console in 1991. Today we're used to coin-ops arriving at home in arcade perfect form, or as close as emulation and control options will allow, but the Neo Geo was the first system to deliver actual arcade hardware to the living room. The system was an investment -- around US$600 for the system, and building a game collection was even more expensive with titles in the neighborhood $200 apiece. But look at that massive Magician Lord cartridge -- packed with so much gaming goodness it needed TWO edge connectors! Magician Lord isn't a bad game, but it falls short of being a great game. The action is simple and repetitive -- walk, shoot magic, jump, duck, climb a ladder, take a couple of hits, use up your lives, and put another token in to continue. Occasionally there are transforming power-ups to acquire, with six different alternate forms for hero Elta the Magician Lord to take, but the game throws so much at our man that (at least in my less-than-capable hands) these temporary modes tend to be very temporary indeed. Aren't we all, dude. But we're only two stages in. Chin up! Magician Lord was an early title for the Neo Geo, and the relatively small 46 megabit cartridge's limitations become apparent as one gets deeper into the game. 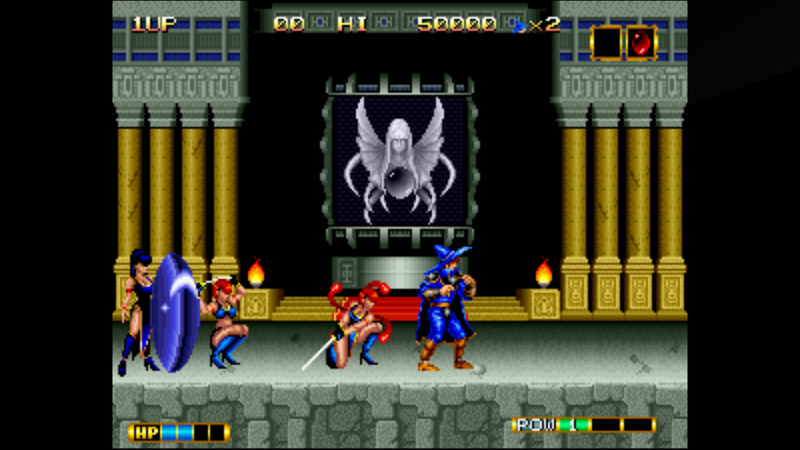 Many enemies encountered in later stages are palette-shifted versions of earlier foes, the excellent 80's-synth background music gets reused on multiple levels, and the maps are generally compact aside from a few late-game mazes that seem very out of place in an arcade experience. 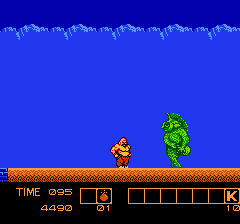 The bosses are large and nightmarish and varied enough, but rather stiffly animated and predictable, and the end of the game wisely features a mini-boss rush rather than revisiting the big guys. But maybe these limitations are part of what I like about this title -- it feels stuck halfway between a coin-op and a home console experience, and it's more richly textured and progression-oriented than most of its arcade and Neo Geo brethren. Over time, it only became more unique as SNK's later success (and title releases) focused almost exclusively on fighting games. 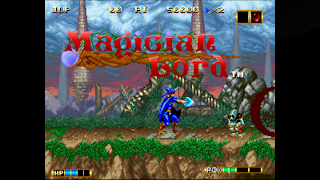 As tempted as I often was, I could never quite convince my checkbook to ante up for the Neo Geo console back in the day, so I only actually played Magician Lord a few times in the arcades, most memorably for the first time at The Circus in Marinette, Wisconsin. I remember being surprised and disappointed that it was never ported to home consoles -- it seems like the Genesis and SNES could have handled a reasonably accurate conversion, or the Playstation if cartridge space limitations were the problem. Maybe it just wasn't popular enough to be worth the effort; the game didn't resurface in any officially licensed form until emulation of the original arcade software became possible some fifteen years later on the Wii, PS2, Playstation Vita, SNK's own Neo Geo Mini line, and most recently on the Nintendo Switch, PS4, XBox One and PC via HAMSTER's Arcade Classics Archive series. 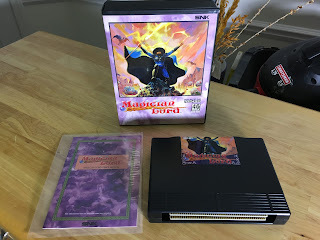 And despite owning the game in multiple forms over the years (even the physical cartridge shown above, despite never owning the console... yeah...) -- and playing it many times -- I realized recently that I'd never actually finished Magician Lord, or even gotten very close to the end. So I bought the most recent PC emulated version (from Microsoft's store, as it doesn't seem to be available via GOG.com or Steam) and set out to tackle it seriously. This time I finally navigated patiently through a couple of frustrating, game length-padding later levels where I'd gotten stuck before, where visually identical doors and ladders are not in fact identical, and made it to the penultimate stage. 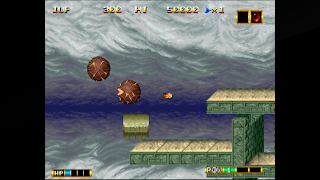 It was here that the nails-hard difficulty very nearly exceeded my abilities, where a series of platforming moves are combined with a plethora of floating, firing enemies and, despite the game's generous continue approach, I couldn't survive long enough to get anywhere at all before putting the next virtual token in. The idea is to jump/walk across a series of floating platforms without getting hit by the floating spheres or their fireballs. I am not an animal! I am not a human being! 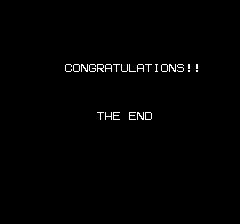 After this point, inserting far more in virtual quarters than the $7.99 I paid for this incarnation of the game to continue whittling down the various mini-bosses and final boss while getting my hat handed to me every few seconds, I managed to make it to the end! "Of course, everyone has died while crops and water were unavailable all this time. I survived by eating my beard." So now I have experienced all that Magician Lord has to offer, and yes, I still have a nostalgic soft spot for this game and will probably return to it now and then. If I'm honest, it was the technology advance the Neo Geo represented, and the just-out-of-my-reach pricing at the time, that really made an impression on me, and this game was just the most personally appealing of the launch titles. But it still makes me very happy to be able to finally play it at home more than 25 years later. Hi, everyone! It's been several months since I've posted here, but my current show is up and running and rehearsals for the next one don't start for a few weeks aside from a staged reading I'm doing next weekend -- whew! -- so I have a little time to do some gaming and writing. 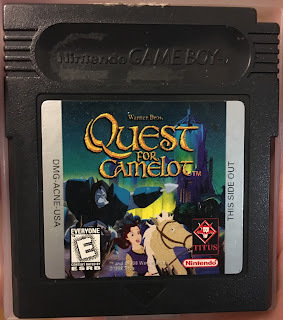 One of my brother's students has given me an opportunity to play a game that hadn't even crossed my mind -- Quest for Camelot for the Gameboy Color, published by Titus Software to tie in with Warner Brothers' 1998 animated fantasy movie. It showed up in the mail on October 1st, so I've been able to spend a little time with it! 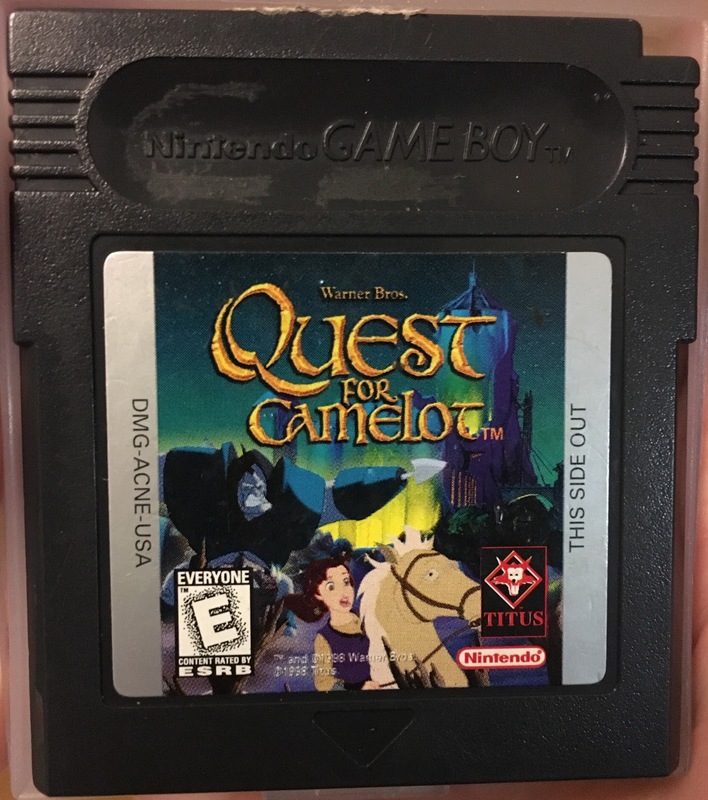 To its credit, Quest for Camelot differs from most licensed titles in that it's not a side-scrolling platformer -- instead, it opts for a Japanese-style Action RPG design. We can select English, French or Spanish language at the start, after which a lengthy sequence of illustrations and text screens sets up the story -- our hero, young K... something, must discover what's happened to... oh, man, I've already forgotten what the storyline is. Time to reset! ... some dude we haven't met before, standing out in the woods someplace and suffering from acute constipation judging from the expression on his face. Oh, wait! When I start walking around and turn the character to the side, I can see that it's Kayley... I think... she has a ponytail, at least, but who knows what she did with her horse? The first person I talk to, a FARMER, gives us directions about how to talk to someone, which is not very helpful as I've already figured out how to GET IN HIS FACE BY PUSHING AGAINST HIM AND PRESSING THE A BUTTON. After telling me that Sir Ruber has captured my mother, Lady Juliana, and warning me about his ruthless knights, and informing me I should visit the blacksmith to the east, he tells me to hold the control pad in the direction of the person I want to talk to and press the A or B button, and that I need 30 gems to save my game. Then Mr. Farmer flees offscreen, apparently in terror of our heroine's aggressive questioning technique or fearing he will be discovered by the RPG GRP (Game Reality Police). 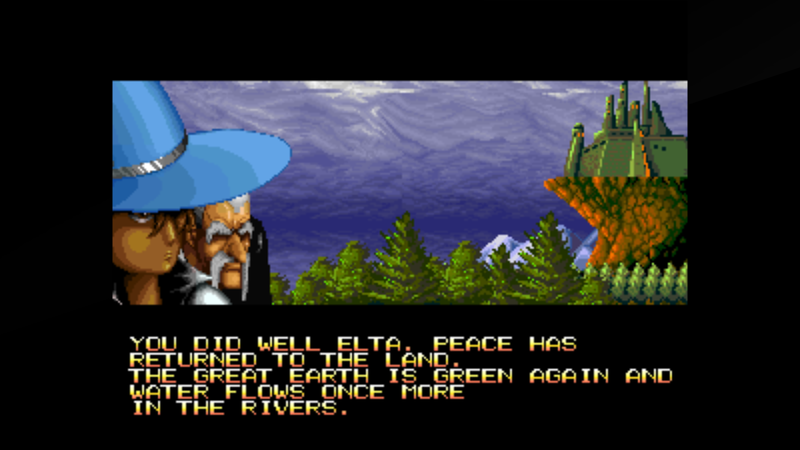 Mr. Farmer's flight has cleared the bridge to the south, but I'm going to go explore to the east before we start out on what I presume will be a long and arduous journey. There's a blue knight wandering around here, and if I walk into him, I lose one of Kayley's five life hearts, accompanied by a horrible farting sound, so I guess he's not somebody we should be talking to. There's an impassable fence line to the east, and nowhere else to go up here, so we'll travel south across the bridge and then head east in search of the blacksmith. We have to avoid some more blue knights in the area, but I find the blacksmith where I was expecting to -- he tells us that Ruber's knights have scared his hens away, and offers to help us if we can round them up. Why the Blacksmith has hens is not explained, so we'll call this Rushed Development Clue #1! Now, a lesser game might ask us to find a hen, or maybe three, but Quest for Camelot is no quick cash-in... we have to find FIVE of the feathered blighters. I find the first one in a cave -- well, it's actually a path to another area of the map, and Kayley's passage through it is accompanied by a flash of light and a rather neat screen-warping effect, rather overselling what appears to be a village underpass. The blacksmith has no interest in only one of his hens, and tells us to keep looking, forcing us to carry live hens around while we search in caves... oh, I guess that WAS a cave, I just expected such a cavern to look different from the surrounding countryside. It doesn't take long to find the five hens, and on my way back to the blacksmith, I encounter a ghostly, shaky-looking, possibly inebriated Merlin, who advises me that RUBER IS IN THE MANOR but we must become a skilled sword fighter before we face him. I soon realize I have wandered into another section of the map and the blacksmith isn't here, but I go back through a "cave" and find my way back to him. He gives Kayley a sword and advises her to seek training from his brother, who lives in A HOME to the south. I hope he means a house. "Here's a great sword for you, the best I ever made! Now go pick it up out of the dirt!" I almost leave without noticing that the sword is just laying on the ground and has not been automatically added to inventory. There's a short, Zelda-ish animation when Kayley picks up the sword, at least. I find my way to the brother's house, and he accuses me of stealing his brother's sword before deciding I look honest. He tells us that we will gain experience through combat, strengthening the sword, and that he will teach me more after I take out all the knights terrorizing the town. Of course, he doesn't actually tell me how to use the sword to fight the knights, and I reach my first GAME OVER screen shortly. (As I replay the opening, it occurs to me that the Blacksmith looks a lot like one would expect the Farmer to look, and vice-versa. Primary evidence: the Blacksmith is holding a pitchfork, plus the aforementioned hens. RDC #2!) This time, I mess around with the interface a bit and figure out that the Save screen (accessed by pushing START) is also the inventory/equipment screen. I highlight the sword and hit some button or other, and the sword moves up to the top row of the generally featureless inventory screen -- and now I can hit the B button to attack with the sword. Quest for Camelot's combat mechanics leave a lot to be desired. Basically, we approach an enemy and start wildly swinging the sword -- if we do it fast enough, we generally won't take any damage, though every contact knocks us backwards a bit so we have to be careful not to get cornered or pushed into the bounding box of another enemy. An energy bar is displayed above the enemy's head when we've done damage, and while no numbers are ever shown, the bar display seems to be based on the maximum number of hit points an enemy can possibly have; all of these guys start with the bar only partially filled. Some enemies drop 10 gold pieces or a life heart when killed, which is handy as I have taken quite a bit of damage just trying to collect the hens. It took me a while to find and kill all the knights, but now the swordmaster teaches Kayley a charged-up spinning sword attack, useful when surrounded (well, purportedly useful -- I found that I took more damage when I tried to use the spin attack instead of just beating on the nearest enemy.) The swordsman advises us to seek Merlin to gain entrance to the manor, which the drunk old wizard does by allowing the formerly (and still) featureless bridge nearby to become a portal, and promises to see us again elsewhere. I almost die at the hands of a number of blue knights just inside the Manor walls, but manage to survive. Inside the Manor, the music thankfully changes to something a little more melodic than the thumping, raspy, percussion-heavy travel tune we've been hearing since we started the game. A servant tells us we need a shield, and he saw a man with a dog pick one up (let's hope the servant's eyesight is pretty good and the guy wasn't just cleaning up after his pet.) Setting out to find him, I run into some cloaked figures -- and the sword as-is isn't much use against them, as they just get larger, doing damage as they press me against walls and furniture, and I die shortly, restoring from a recent saved game to continue. I find the man in the southeast corner of the manor -- his dog has indeed gone missing, so we have another fetch quest to complete. While looking, I discover that contact with the cloaked enemies causes them to give chase -- so it's really important not to attack or run into them. I see Merlin yet again, who tells us we need to find a grappling hook, and a dungeon key, and then pick up an arrow outside; he also mentions that we can open chests by swinging our sword, as one does. It's about at this point that I start to wonder who this game's target audience was meant to be -- the adventuring and puzzle-solving is pretty elementary, but it becomes a tedious stealth game at this point, and sometimes the ghosts start making a bee-line for our heroine without apparent provocation. In other words, I am dying A LOT. I find the guy whose dog is missing again, but no sign of the dog -- in fact, he seems to have given up, and just assumes the dog will come back when it's hungry. I also find a large gem of no practical value. Wikipedia tells me that the game has 9 worlds and 60 levels... oh, man, this does not sound like fun. For the purposes of exploring more of the game, I enter a GameShark cheat code (010518C1) that refills Kayley to full health whenever she takes damage. And I learn, of course, that if we run into a ghost with the dog in tow, the dog runs away. so it takes me a few tries to get the dog safely back to its owner and earn the shield. With the shield and grappling hook in hand, I discover that we can only have one item equipped at a time, so we'll have to be choosy about our inventory handling. Returning outside the castle, I realize that the "ARROW ON THE GROUND" Merlin mentioned is actually a pattern of stones on the ground pointing to where we can use the grappling hook, allowing us to access the upper level of the Manor and fight some more knights. And my sword levels up, apparently having drawn enough blood to be more powerful now, though there's no indication onscreen of its level or its XP, so it's anyone's guess as to when it will level up again. I find the dungeon key up here, so we're getting closer to fighting Sir Ruber -- Merlin is standing by the dungeon entrance, and now we can enter it. Kayley finds herself in an underground maze patrolled by giant spiders now; they're fairly tough to kill, and our progress is slowed by webs on the ground so navigation becomes more important. A tunnel leads to a boss battle with Sir Ruber, who leaps around like an idiot, descending on Kayley's head and otherwise being hard to hit without taking plentiful damage. And he looks more like Peter Boyle as Young Frankenstein than any of the other crudely-rendered Sir Ruber images we've seen so far. I finally manage to wear him down, but despite Merlin's warning that Kayley must not let him escape, he escapes. 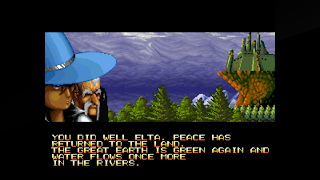 A cut-scene (well, some scrolling text followed by some Warner-approved illustrations eating up cartridge space that could otherwise have been used to enlarge the maps or improve the graphics) establishes that Ruber's attempt to steal Excalibur from King Arthur was interrupted, but the legendary sword is now lost in the Forbidden Forest. The forest is patrolled by invincible moving rock formations, snakes, and winged creatures that are particularly hard to get into sword range without taking damage. Someone named Garrett guards a bridge and will only let us past into the more dangerous part of the forest if he believes in our sword skills, which I will presume means the sword must be at level 2, as despite all the fuss he lets us through immediately. The blue knights have given way to more dangerous gray knights, and we can find Garrett in his house in the forest, though he throws us out immediately for no specific reason. Merlin continues to wander around the map, and here he appears to warn us about a deadly giant plant ahead -- to defeat it, we need a MAGICAL STICK (back to basics here) and he won't let us past without it. Sure enough, we meet another farmer (this time represented by the graphic used earlier for the blacksmith, RDC #3! Bingo!) whose garden has been destroyed by Ruber's knights. He wants us to kill all the knights in exchange for some reward. The worst thing about these "kill them all" quests is that we're given no indication of how many potential victims there are, so Kayley has to wander around the map, murdering people until she thinks she's dispatched everybody, then check in with the quest issuer to find out if she's really done or not. While hunting down knights, I visit Garrett's house again -- and this time, the game state has changed so that instead of just throwing us out for no stated reason, he's quite talkative. He volunteers that he knew Sir Lionel when he was a stable boy, and he opens up a sealed spider cave where the magical stick is rumored to be hidden. On the way there, I spend 50 gems on a magic shovel offered by a merchant standing in the middle of the woods, not really the best location for a retail operation. The cave is filled with pitfalls that kick us back to the entrance, and the spiders here are fairly resilient. The magical stick is hidden in a chest, and now we can continue. As I exit the spider cave, my sword levels up again, its lust for bloodshed ever increasing, kids! I manage to kill all the local knights, and the farmer now allows me to dig up turnips in his garden with the shovel I just bought. Apparently a horse in the area likes turnips, and that's why we're doing this? I find a bunch of small turnips which the game displays but doesn't seem to acknowledge, until after quite a bit of digging I turn up a large one. Now Merlin opens up the gateway to the plant boss, but a strong wind prevents us from walking there, which is apparently why we need to find the horse. Sigh. Looking hither and yon for the horse, I dig in a suspiciously artificial-looking rock formation to find another heart container, which if I weren't cheating already would be very valuable. And I finally find the horse, back near the beginning of this whole area of the game to ensure maximum backtracking play time. While we're on horseback we can't fight the knights, so I try to avoid them. The horse gets us past the wind (I think we needed to have found the large turnip to make it, suggesting the horse is partly flatulence-powered) but then disappears after we're on the other side. He doesn't run off, he doesn't stop and graze, he just vanishes into the thin air. We now find ourselves in a maze with little, minimally fire-breathing dragons to kill (think Fygar in Dig-Dug, with a short-range lick of flame coming out once in a while.) I find a slingshot in a dead-end part of the maze, a heart refill, and finally enter a cavern where small carnivorous plants attack from the walls, forcing us to avoid them. The boss battle occurs not too far into the cave, and is perhaps the most tedious affair I've seen in an Action-RPG, thanks mostly to the game's awkward interface. We have to switch to the magical stick, get it into the giant plant's mouth, switch back to the sword, and attack until it breaks the stick -- apparently what's magic about it is that it can be reused indefinitely. It's hard to dodge the plant's randomly attacking underground tendrils and get close enough to put the stick in without taking damage, and the constant need to interrupt the action to switch equipment becomes tiresome quickly. So I just keep switching and doing and switching and doing some more, thanking the GameShark every so often for keeping Kayley alive in the face of my sheer combat incompetence. Finally defeating the plant takes us back to Merlin, who informs us that there's yet another crisis to take care of before we can face Sir Ruber. Merlin tells us we have FOUND ALL THE SECRETS, though he doesn't elaborate on which secrets, exactly. And he gives us one piece of a mystical... eight piece... parchment. And then... my game hangs. I can't move or access the menu? Oh, it's just a dramatic pause, apparently. We now enter the Dragons' Territory, where Kayley meets Devon and Cornwall, a two-headed bickersome dragon that was apparently a major character in the Quest for Camelot feature film. He tells/they tell us we need a dragon's scale to cross a large body of water to find Excalibur, and some dude has it. And exploring this world is even more of a pain, because if we sink in the lake accidentally, we are put back at the beginning of the level, and navigating the narrow shorelines without falling in the water proves pretty difficult until I get the hang of it. And for your humble blogger, at this point my motivation is gone for completing this particular Quest. We're approaching one-third of the way through the game; we fought Sir Ruber once already, and while I'm sure he'll be disappointed if he doesn't get to battle us again, I'm starting to share the title screen's distinct lack of enthusiasm. The game isn't as lightweight as I expected, but by the same token it feels padded throughout -- the maps are small and full of wandering and retreading, the inventory handling is awkward, the graphics and sound are stuck somewhere between passable and terrible, and the amount of fetching and finding required to make progress makes it hard to care if Kayley ever succeeds. Ed. : As many have noticed, I'm finding it difficult to keep up with my adventuring and blogging of late. So I'm changing up my approach a little bit -- feedback is welcome! For several years now I've been doing comprehensive playthroughs and avoiding more recent games -- unnecessarily, as it turns out, since walkthroughs are actually easier to find for modern adventures than the vintage text games I often choose to battle through. So I'm going to try a lighter approach and see how that works -- I'm going to play a game for fun's sake, capture a few screenshots, and then write about it from recent memory, rather than trying to take detailed notes along the way. I won't be doing reviews, exactly, and there will still be some spoilers here where I want to comment on or illustrate something notable. But I'm going to try to focus more on what a particular game brings to the adventure gaming genre, and how it uses or changes its conventions, and break my old habit of narrating every step of the game, at least where more recent titles are concerned. 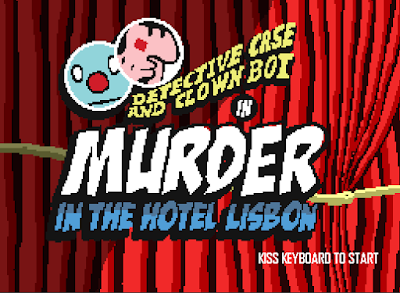 So, with that said, I've recently been playing Portuguese developer Nerd Monkeys' 2014 point-and-click animated adventure, Detective Case and Clown Bot: in Murder at the Hotel Lisbon. The adventure game genre never quite died off commercially outside the United States, though I was surprised to see this effort is not implemented using the near-ubiquitous Adventure Game Studio, but Game Maker Studio. The game is designed by Filipe Duarte Pina and produced by Diogo Vasconcelos, with backgrounds by Luis Bacharel, character design by Nuno Saraiva, a great jazz combo score by Rafael Pina, recorded with live instruments but yet somehow seamlessly looped when necessary. The story is straightforward -- our hero and avatar, the amoral Detective Case, must solve a murder as well as several supplementary cases with the occasionally helpful assistance of an inherited robot sidekick who wants to be a stand-up comedian. (Straightforward as adventure games go, anyway.) The game mechanics are kept simple, and there aren't really any inventory puzzles of the traditional sort -- we do collect items and evidence, but they are used primarily within the victim and suspect interview sequences that provide the bulk of the gameplay. The writing is funny, unabashedly bawdy and politically less-than-correct at times, but it's not self-conscious or smarmy. The translation to English is sometimes grammatically awkward, and there are a few jokes I never was able to grasp, but the characters come through well enough. The game is not voiced, probably to reduce costs and localization challenges, which I appreciated when trying to click past repetitive dialogue exchanges. The game's visual design is very consistent -- the camera angle never changes, so the same sprites are used everywhere; there's not even any scaling, as all entrances are left, right, or through a doorway that transitions to another location. This is used creatively to accommodate a raucous foreground audience that treats the early going as a sitcom, and as a happy byproduct, the game's fast-travel taxi can be summoned anywhere, even inside a hotel room, to speed up gameplay. There aren't many locations in the game, but the excellent score and well-chosen colors and background details keep the visuals interesting. There's not a lot to actually do in this adventure, beyond pursuing the case at hand by exploring the world, finding connections and interviewing the parties involved to elicit information or confessions. There are quite a few funny little details to check out and conversations to trigger, but many are optional and unvarying, and there are only a few cases where pixel-hunting becomes necessary to find an important item. 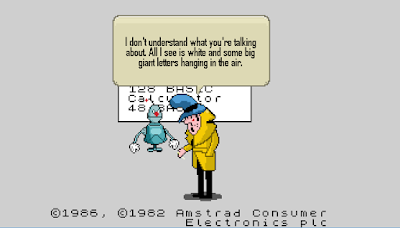 The interface is helpful -- Detective Case can ask Clown Bot for a reminder about the current objective, and we can review the items in inventory to learn additional details that might trigger an investigative path. 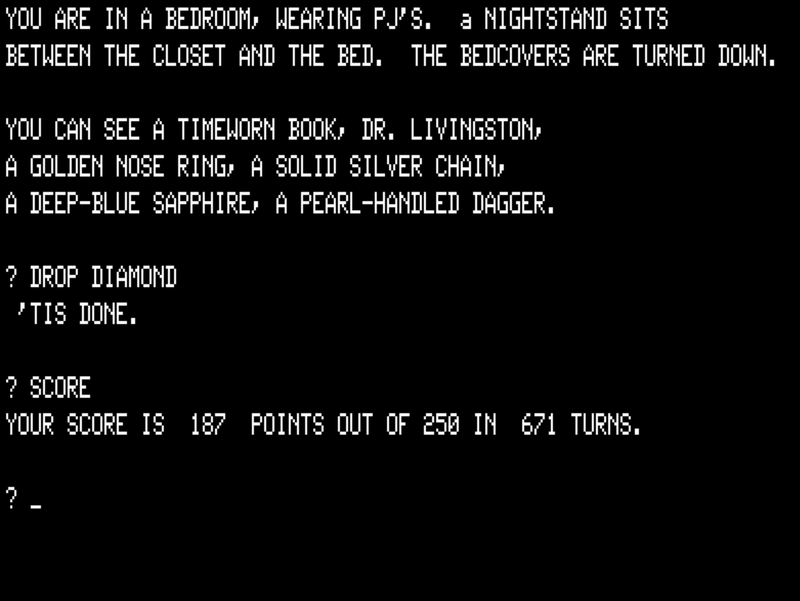 The core of the gameplay is the interviewing mechanic, a graphical reinterpretation of the classic ASK [SOMEONE] ABOUT [SOMETHING] text adventure approach, enhanced and/or limited by multiple choices for both questions and objects. 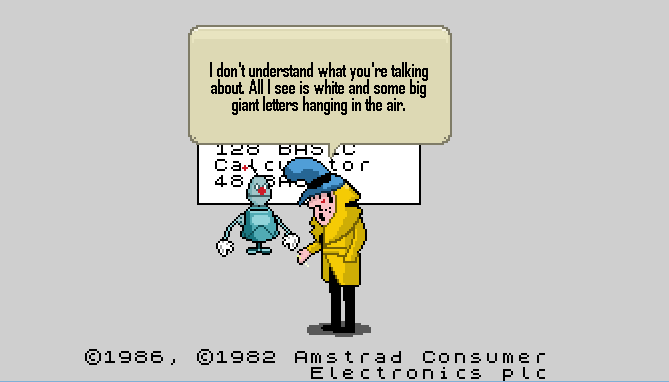 This has always been a problematic approach for me going all the way back to Infocom's The Witness -- each puzzle succumbs to trial and error, of course, but one never feels like much a detective when resorting to that. Here, we're not allowed to initiate an interview unless we have all the necessary evidence to complete it successfully -- a reasonable design choice that saves us from too many dead ends, but it still doesn't help when we just happened to miss an important item somewhere and wish we could talk to someone to pick up an idea about where to look. There's an additional layer of complexity here -- we can conduct a given interview as Detective Case or as Clown Bot, and some suspects react very differently to the two characters, leading to different outcomes based on the same evidence. 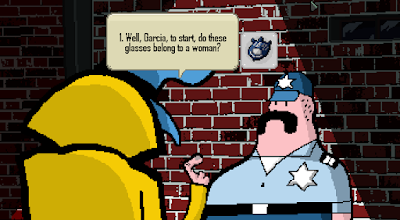 And the game's finale requires us to interview two different suspects at the same time, switching back and forth through six rounds of questioning instead of the normal three. Unfortunately, the whole approach is sometimes a little opaque -- two questions may make basically the same point in slightly different ways, with one being successful and the other failing miserably. Essentially we read the three possible questions, review our current inventory, and select the most productive question paired with supporting evidence. But sometimes two pieces of evidence that should support the same line of questioning produce very different results, and sometimes a piece of evidence that seems tenuous at best ends up being the one the game wants us to pick. So there's still some guesswork involved in these interviews, and the finale is especially vexing -- we have to replay the question/answer pairs we know multiple times as we try different combinations for the one we're currently stuck on, and there's no way to save the game mid-interview, leading to a lot of repetition that becomes frustrating the closer we get to finishing the main story. This last joke is handled particularly nicely -- the game autosaves before we enter this area, as there's no way back in once we've exited, hinting at the frustration of 1980s game crashes and adventuring dead ends without forcing a replay. There's also a nice nod to the development team, appearing as alley dwellers in an optional area of the game, and the band in a restaurant can be induced to play an entire song complete with vocals. The music really makes up for a lot of the gameplay's limitations -- there's always a jaunty, promising feel in the air even when the hunt for evidence, suspects and the right combination of interview questions bogs down. And that's what I have to say about Detective Case and Clown Bot: in Murder at the Hotel Lisbon! It's not a must-play adventure, but I look forward to seeing what this developer comes up with in the future -- the intentionally limited style seems to be working for Nerd Monkeys, and I appreciate that they aren't biting off more than they can chew like some other indie adventure game devs. Sometimes a simpler style benefits more from modern technology than an envelope-pushing style the budget can't support. Thanks to all the longtime readers inquiring as to my whereabouts. I assure you I am well, just busy with life elsewhere. I have not written a new post since August of last year, and my old weekly schedule will not be returning any time soon, so I'm going to just start calling these "Adventure" posts instead of "Adventure of the Week." Anway, I had a little free time this weekend, and so I wandered randomly into the SoftSide disk magazine archives in search of something I haven't played yet. 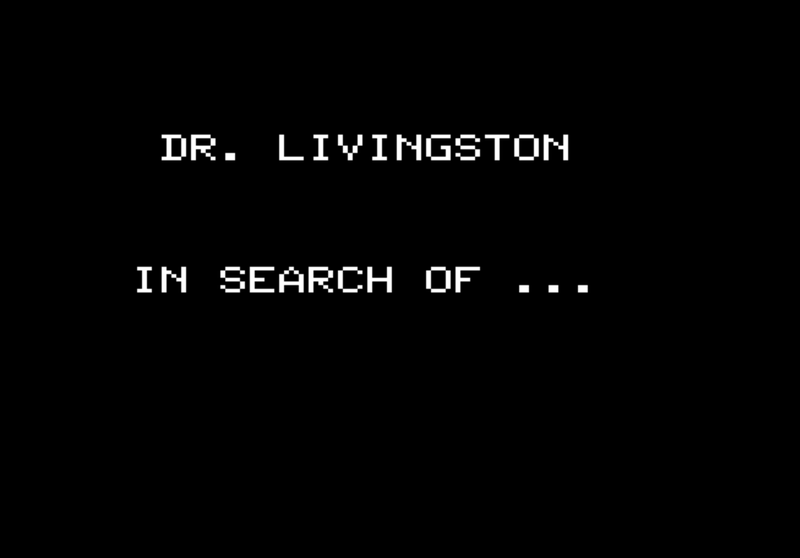 And I discovered that I had somehow overlooked this TRS-80 text adventure from September of 1980: Dr. Livingston, In Search Of... -- also known as African Adventure: In Search of Dr. Livingston when it was ported to other platforms later on. It's basically a jungle-themed treasure hunt, without much of a plot to speak of. Like many of the SoftSide adventures, this BASIC-language game's author is uncredited -- the engine appears similar to other games the company published, which I will probably appreciate if we get stuck along the way. 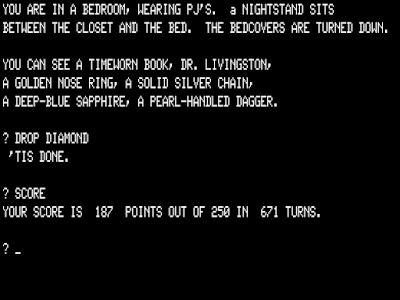 This game predates the availability of lowercase alphabet display kits for the venerable TRS-80, so the parser will only recognize entries in uppercase. We begin where so many other adventures begin, in a bedroom, presumably our own, in pajamas, with a closet, a bed, and some bedcovers that are curiously emphasized in the text as TURNED DOWN. There's also a TIMEWORN BOOK on hand, so it makes sense to READ BOOK. Oh, right, YOU DON'T HAVE IT. I am clearly out of practice! I GET BOOK -- 'TIS DONE providing a nicely period-appropriate parser response -- and then READ BOOK; TRY READING IN BED. Um... okay. I GO BED and now we can finally READ BOOK to discover its title: "AFRICA - LAND OF THE UNKNOWN - BY R.U. REDDE." 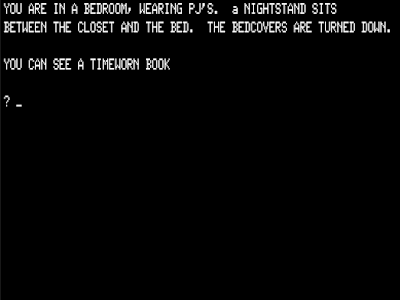 The book seems fairly central to the action here, as we can also OPEN BOOK and READ PASSAGE: "... PLORER NODDED OFF TO SLEEP, HIS THOUGHTS BEGAN TO DRIFT T..." This seems like a clue, but we're not allowed to SLEEP, GO SLEEP or CLOSE EYES, so I'll GET UP and see what else we can do here. EXAMINE CLOSET yields no information... and neither does GO CLOSET? Ah, we have to OPEN CLOSET, adding a faded red knapsack and a pair of hiking boots to the visible items in the room. I'll GET KNAPSACK and GET BOOTS -- they are automatically worn, it seems. OPEN KNAPSACK reveals only that it's already open, and I can't seem to PUT BOOK or DROP BOOK in any way that involves the knapsack, so we'll assume it is just here for show or perhaps to increase our carrying capacity. There appears to be no way to leave the bedroom -- N, W, S, E, U and D all reveal various blocking messages. I suspect these are randomized for variety, and that the "THAT DIRECTION IS SEALED OFF" text doesn't necessarily mean we can open up a passage there. We can't seem to do anything with the nightstand, so we'll try going back to bed. I suspect we need to sleep, but repeated reading of the book doesn't do anything, and I can't PULL BEDCOVERS or COUNT SHEEP. Ah! DRIFT OFF is hinted at by the passage in the book... and now we find ourselves DRIFTING IN A ROWBOAT ON A LAKE. 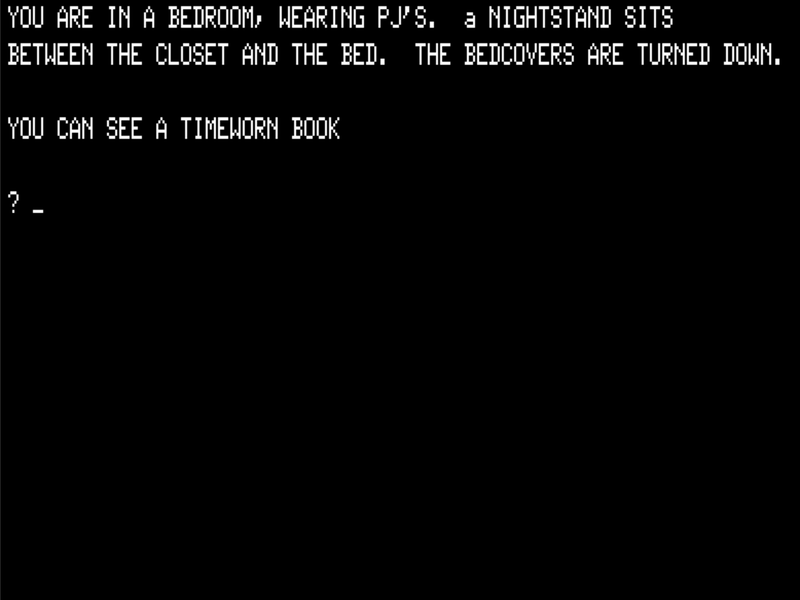 That's a nice transition of a type peculiar to text adventures -- the conceptual pun, if you will. There's a tiny grey mouse in the boat with us, and we can see a beach on the eastern shoreline. We can simply GET MOUSE and store him in the knapsack, and go E to arrive on the shoreline with our boat conveniently tied to the dock. The game does not in most cases tell us which directions are available for travel; going N is unsuccessful, so I'll head S into a grassy plain where a native throws a spear at us. Fortunately, HE MISSES AND RUNS OFF, and we can now GET the poison-tipped SPEAR. The grassy plain is a bit of a local maze, and I eventually find my way out to the east, where a trail begins near a tree. It would not be an outdoor adventure game if we weren't obligated to CLIMB the occasional TREE, and this one hosts a VICIOUS VIPER. We can't seem to SPEAR VIPER or KILL VIPER, but this snake isn't particularly strike-happy, so I'll climb back Down and head south onto the trail. We can see cliffs to the east leading to a plateau, but I'll continue south for now to the overgrown end of the trail where we find a sack of coffee beans, which we'll take with us in case they come in handy later on. We can't go any further south, but we can travel east to see a nearby village. This would be a good time to SAVE GAME, if this engine sported such a feature; but it does not, so I'll have to live in 2016 and make do with an emulator save state. As we enter the village, A VOLLEY OF SPEARS FLIES OVER YOUR HEAD! AN OBVIOUS WARNING! So we'll take this under advisement as we flee back W... except we can't go back that way! I stumble S into a hut, where we find a crumpled note that reads: "SWAMI DIAMOND." Okay, I was hoping for something a little more coherent, but we'll keep the note in case this comes to mean something later on. Unfortunately, when I re-emerge from the hut, we're dead, presumably from a native attack, with only 5 of 250 possible points earned -- but to my surprise, this early game actually has a bit of an auto-rewind feature, and we find ourselves drifting in the boat on the lake again. However, we have none of our inventory... though this turns out to be informative, as when I make a direct return to the native village, people seem much friendlier and one native offers a trinket in trade for something. I think perhaps we are better received if we're not carrying the spear I picked up earlier... and yes, if I restore my earlier save and DROP SPEAR before going into town, we're safe here. I can't TRADE KNAPSACK or TRADE MOUSE, so let's do some more exploring. I find a jungle south of the trail's end, where we meet a wild dog who is not friendly. Fleeing at random, I find some quicksand -- we can't travel north across the quicksand, it seems, though we can see that a trail continues beyond. I can't seem to find a way out of the jungle, either, so we'll restore again and check out the cliffs alongside the trail we saw earlier. A FIERCE BLACK LEOPARD BARS THE WAY to an opening in the cliffside, and we can't THROW SPEAR (it just hits the ground) or KILL LEOPARD (THAT'S TOO DANGEROUS.) So I'd better map this area out more thoroughly and make sure I'm not missing some important inventory items. Oh, wait -- I didn't try to TRADE the coffee BEANS to the friendly natives, and that works -- now we have a GOLDEN NOSE RING in inventory and 20 points in our SCORE. 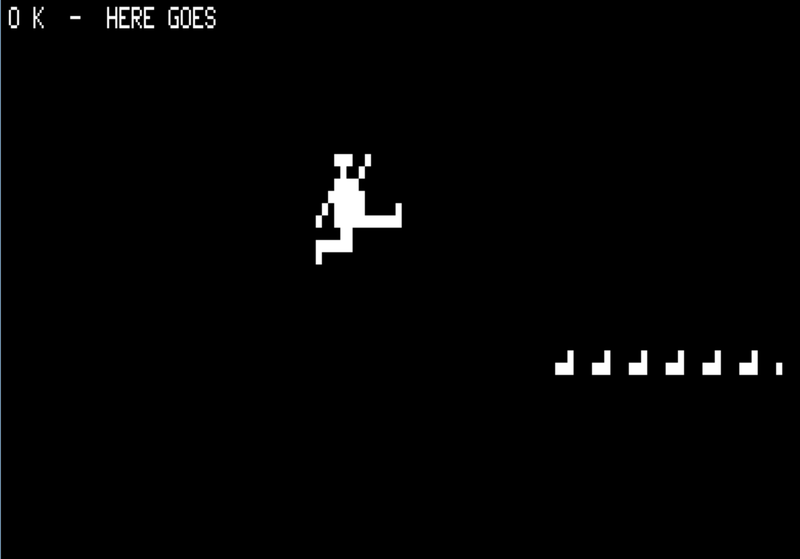 I try to JUMP QUICKSAND when I run across it again, and the game asks, "DO YOU REALLY EXPECT TO JUMP OVER 30 FEET?" To my surprise, when I answer YES, the game displays a short bit of vintage TRS-80 animation as we leap over the quicksand with a satisfying "TA DA" at the end! Safely on the opposite side, we can acquire some sugar cane. I wander around some more, and apparently we've been whittling as we walk, as suddenly we're informed that we've converted the sugar cane into a CHARMING LITTLE FLUTE. I also discover that if we DROP MOUSE by the plateau opening, the leopard is startled into flight and we can now go U into the opening, where we find a SPARKLING DIAMOND, worth another 20 points it appears. I discover we can enter the cave to the east, finding a cavern and a pearl-handled dagger -- but our load is getting too heavy, and there's an occasional unsettling voice heard uttering the word "SWAMI," so I'd better decide what to do with some of this stuff. I can't seem to PLAY FLUTE, but I can CHARM VIPER with it, and take the LETHARGIC VIPER along. We can DROP VIPER near the wild dog in the jungle -- the two fight and both disappear into the quicksand, and a DEEP-BLUE SAPPHIRE appears sparkling in the grass. There doesn't seem to be much of a plot in this adventure. Can we stash these treasures back in our bedroom? Yes, if we return to the boat and DRIFT again, we find ourselves back home. And now we have 102 points, suggesting that this is indeed what we're meant to do with the treasures. I also discover that we can only DRIFT at home when we have the book in inventory, but it does not travel with us to the rowboat. I return to the caverns and acquire the pear-handled dagger, then find a passage heading east to a valley. A trading post here offers a silver chain in exchange for something... there are ears of corn in a field to the south, but they aren't in demand it seems. I find two shrunken heads on a sign to the west -- apparently headhunter territory. I also find some groundnuts near a squirrel running by, with a sign suggesting this is also a trading post of some kind, although it may just refer to the nearby hut we visited earlier. To my surprise, I can TRADE GROUNDNUTS for the silver chain. Time for a trip home to drop off some treasures, and we're at 137 points now. Exploring some more, I find a hungry alligator lurking in the marshes but am unable to escape being eaten by him. I stumble into the UJIJI VILLAGE, land of the shrunken-head artistans, and in a pit to the south I actually find Dr. Livingston! I can't GET LIVINGSTON -- or can I? The parser responds, DR. LIVINGSTON?, and when I guess successfully by typing the "magic words" I PRESUME, 'TIS DONE, and now we have him in inventory! We can take Dr. Livingston back to our room and drop him there, and now we're at 187 points. So it feels like we've finished the story, but we must have at least a few more random treasures to acquire. What haven't we done yet? We can THROW SPEAR to kill the alligator, though the result is randomized and it took me a few tries and fatalities before I succeeded. This doesn't seem to accomplish anything new, though, and eventually the DEAD ALLIGATOR is replaced by another HUNGRY ALLIGATOR with nary a treasure or other substantial change in sight. Looking at the code, I don't see any other treasures or events I haven't seen. It turns out that we get points for dropping ANY of sixteen inventory items in the bedroom, not just the treasures -- and in fact, it looks like we are better off keeping some of the mundane items than going for the treasures in trade, although there are some other specific scoring events that award points so it's not strictly a matter of treasure hoarding. We've seen what there is to see here, it appears, and I'm not motivated to track down the perfect combination of actions to earn all 250 points, so I'll leave that as an exercise for more obsessive adventurers than I. 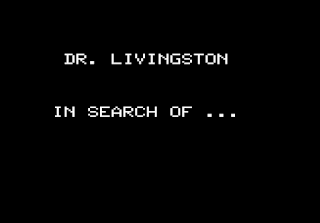 So I think that's it for the oddly named Dr. Livingston, In Search Of! And I hope to be back, if not next week, at least relatively soon with another post. Thanks for reading, and for your patience of late! FYI, my postings here are going to be less frequent for the next several months. I've taken on a couple of theatre projects that are going to eat up more than my available free time, and it's a busy time of year on top of that. But rest assured I will be back, I have some games in the pipeline that I haven't written up yet and several more I am eager to tackle. Thank you for your patience.